Beautiful Shades of Brown: Early To Rise Challenge: Day 18, or Fredrika didn't wake me up! Early To Rise Challenge: Day 18, or Fredrika didn't wake me up! 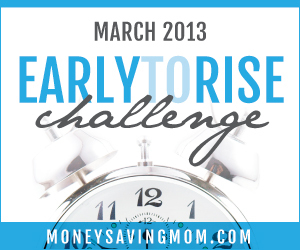 This is Day 18 of the Money Saving Mom Early to Rise Challenge! 1. I went to bed around 10:15 ish...but couldn't fall asleep until 11:30 :( Lying there really made me think about deep and profound things. ~ Did I turn off the light in the kitchen? ~ Oh yes, I did. ~ Is there any chocolate in the house? ~ Oh, no, there's not. ~ Is it time to get up yet? I would really enjoy a cup of coffee. ~ Liz, do you realize it's only 10:21 pm? And then I realized the last answer was hubby, who I was apparently annoying with my questions. He suggested I read a book for a bit, to help wind me down. I guess annoying questions are not the way to wind down? P.S. The part of the above story involving hubby is untrue. But what does remain true is annoying questions are not the way to wind down, whether asked to ones self or to their attempting to sleep hubby. Mine, for the record, was out cold. 2. 11:45 : Yes, that's right. 15 minutes after I'd been BLISSFULLY asleep....D-baby wakes up and will NOT go back to bed for Hubs. 3. 12:10 : D-baby is finally asleep again (PTL!) and I'm headed to bed, fall asleep quickly (and blisfully) and don't wake up until 6:00 am when Hubby's alarm, Steve, wakes us up. 4. Wait. 6 am? But Fredrika was set to go off at 5 am. I ask Hubby if he heard her go off this morning and he notes he didn't hear a thing. Which leads me to believe she didn't go off this morning, cause he HATES the sound of my alarm. Indigenous Tribe Preparing For War was how I believe he described my alarm. Not the way he likes to wake up in the morning. So instead of having enough time to get down here and post, I just got on with the day, sans ETR Challenge :( . Today's passage covered the sum total of the effects waking early will have on the world and how many small good choices will lead to a bigger good cumulative effect on your life. We also choose who we're going to be today. But what ever role we believe we are for today, fill it, and fill it well. Daughter of the King, daughter, sister, wife, mother, housekeeper/manager, friend, citizen. The two I'm going to excel in today are sister and friend. These two rarely if ever get picked, and I need to focus in on them and their cumulative effects. 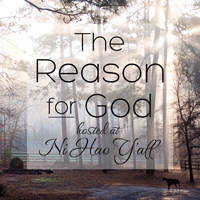 Maybe bringing a family closer together, maybe letting one know they're not alone. What are your roles in life and what two do you think you'll excel at today?